I enjoyed Flight Behavior by Barbara Kingsolver, but I don’t know if I would characterize this novel as suspenseful (see below). 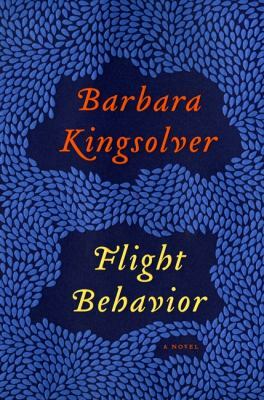 I’ve read a few other novels by Kingsolver and would consider her a favorite, but while this book was good it wouldn’t be at the top of my list of her books (Poisonwood Bible). As with most of her work the natural world is a major character and in this story climate change takes center stage. 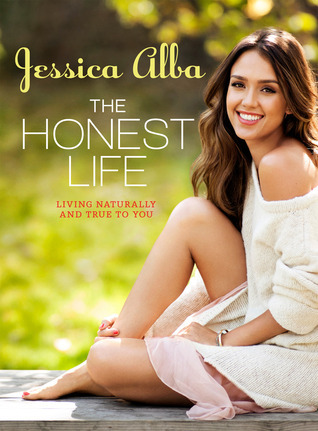 One of my friends referenced this book a while ago so with the start of the new year I decided to look into some healthy lifestyle changes and requested The Honest Life from the library. Normally when it comes to celebrity lifestyle books I approach them with a grain of salt. Alba’s focus is on living “naturally,” so living in a way that’s eco-friendly and getting rid of as many of the toxic chemicals in our daily lives as possible. This means thinking hard about the food, clothing, furniture, cleaning supplies, etc. that you buy. Alba’s motivation for taking this approach to life came when she got pregnant with her first daughter and started freaking out about wanting to keep her safe and in as “pure” an environment as possible. This eventually led her to start up The Honest Company with a focus on creating eco-friendly products that are high quality and visually appealing. While she definitely references her company a lot in these pages, she also recommends other products and companies so it’s not just one big advertisement for her business (though it does make you curious to check things out). The book was accessible and there were a lot of really helpful tips I was able to take away. I liked that in addition to food and cleaning products she talked about beauty, parenting tips, fashion, and design. If you want to focus on living an eco-friendly life there are ways to do this in every aspect in your world. I’d recommend this book if you’re interested in this lifestyle choice. Like I mentioned, the book is very readable, helpful recommendations are made, and Alba includes a complete list of references at the end including contact information for all the companies/resources she talked about in the book. Cat is a 16-year-old high school student who lives in a small town in North Carolina. Her best friend, Patrick, has recently been the victim of a hate crime. Patrick lies in a coma and Cat has taken it upon herself to try and figure out who is responsible. Because the town is so small and everyone knows everyone Cat doesn’t think the police are going to take things seriously, preferring to blame the crime on outsiders. But her older brother and his friends (also known as the Redneck Posse) have been acting pretty weird since Patrick was found. She doesn’t want to believe one of them could be responsible, but the evidence is mounting that this was an occurrence people are trying to keep quiet. And people aren’t happy that Cat is nosing around for answers. I can definitely see the appeal of this YA book. I wasn’t necessarily wowed by it, but the story was good and kept you engaged because you’re trying to figure things out right along with Cat. It addresses issues of acceptance, homosexuality, poverty, and drugs – Myracle doesn’t try to skirt around or sugarcoat anything. The narration for the book was good, with a spot-on southern accent. 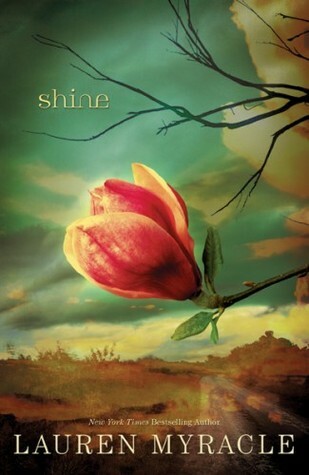 If you enjoy reading YA books and appreciate a good mystery (but don’t mind some tough language and situations) you might want to pick Shine up. This was a very quick read. Rosary beads, and the prayers that they facilitate, are a staple of Roman Catholic spirituality. However, Robert Llewelyn, an Anglican priest, takes an ecumenical approach to the use of the rosary. 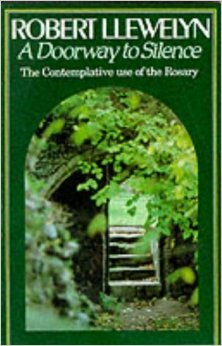 In fact, his book is basically about the nature and practice of contemplative prayer in a general sense, with some pointers about how the rosary can be an aid to its practice. The structure of the book is informal and meandering. Each page is headed by a theme related to prayer and contains a short essay or a few collected quotations from other spiritual writers. Llewelyn includes some alternative prayers to those that traditionally accompany the rosary. This is clearly a book written by someone who spent a lifetime practicing prayer and other spiritual disciplines. Llewelyn’s spiritual directives are straightforward, simple, and realistic. This gives an air of practicality to a subject that might otherwise be considered anything but practical. Principles from Jungian psychology and Zen Buddhism are also discussed, serving to show how Christian spirituality interacts with and learns from other religions and systems of thought. Those who are interested in the spiritual practices of various religions should find this book of some help. This is a book about foodies who are obsessed with extreme food. Goodyear journeys through some unusual dining experiences on the East Coast, West Coast and in Las Vegas. If you think you are a foodie and a food adventurer, think again! This book certainly opened my eyes. In one chapter Goodyear introduces readers to entomophagy: human consumption of insects. We learn how to catch, prepare, cook, and eat insects. I was surprised to find out that in most parts of the world, including Central and South America, Africa, Asia, Australia and New Zealand, insect eating is common. Goodyear explains there are a number of restaurants that serve exotic food such as live octopus, testicles, organs, and shark’s fin soup. But she also takes readers to places that are not open to the public that cook and serve endangered species and wild animals. I enjoyed most chapters. Goodyear’s lively writing style makes it easy for readers to visualize the food. That’s a good thing in most cases. I did get grossed out a few times. Animal cruelty is covered as well. In order to produce buttery foie gras, more food is fed to geese and ducks in order to deposit large amounts of fat in the liver. I knew that, but it’s sad to read about it and know that this force-feed method is widely used. A pleasant surprise was the coverage of the history of the FDA and the pasteurization of milk in the early 1900s. 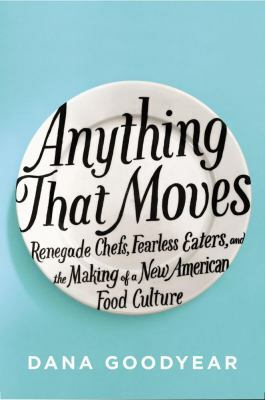 Anything That Moves is an entertaining and informative book for foodies with a strong stomach and an open mind. In the previous decade, North American evangelicalism saw the rise of the “emergent church.” This trend explored new forms and expressions of Christian faith which drew on traditional elements of Christian spirituality and liturgy in a way that took seriously a postmodern context. This was not so much an organized movement as it was a set of impulses that guided the thinking of many Christian writers who had come from and were dissatisfied with an evangelical background. “Emergent” impulses have been a part of the United Kingdom’s recent theological history as well. The Church of England’s 2004 report, Mission-shaped Church, was the official appropriation of the various “Fresh Expressions” by England’s established Church. In For the Parish, Andrew Davidson and Alison Milbank, both priests in the Church of England, make the case that, instead of opening up new avenues of ministry, the initiatives of Fresh Expressions actually weaken the Church and undermine the traditional parish structure. The book is a bit uneven. At times it is hard to know precisely who the audience is. The authors seem to assume a fairly popular lay readership, but they consistently wade into a depth of theological analysis that seems inappropriate for such an audience. It also seemed that they were arguing against straw-men at points. I’m not sure that proponents of the Fresh Expressions would always recognize the positions that the authors are critiquing. That being said, I am very sympathetic to the basic perspective of the book. I thought that two of the later chapters, which laid out the positive vision of the authors, were the best parts of the book. 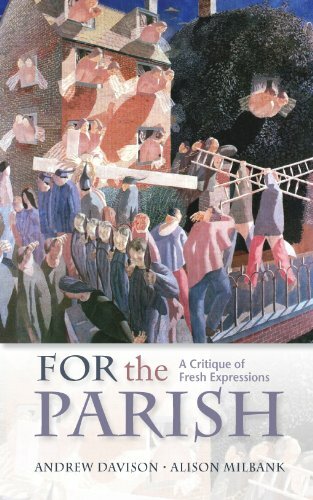 Chapter 7, “The Parish,” is a fascinating look at the development of the traditional English parish system as well as an exposition of its ability to promote social cohesion and shared vision in communities. Chapter 8, “Rebuilding a Christian Imaginary in the Parish,” showed how the parish, as a durable and flexible institution, can continue to creatively minister to the diverse needs of people in particular localities. This book should be of interest to those who follow current trends in ecclesiology and in contemporary English religious life. In particular, if you enjoy watching British mystery programs or reading English mystery novels, this book will give you some insight into why parish priests and church buildings are such ubiquitous features of these genres. The parish system is an essential part of understanding English history and culture, and this book explains and defends that heritage. I don’t remember where I heard about this book, but I’m so glad I got a chance to pick it up! 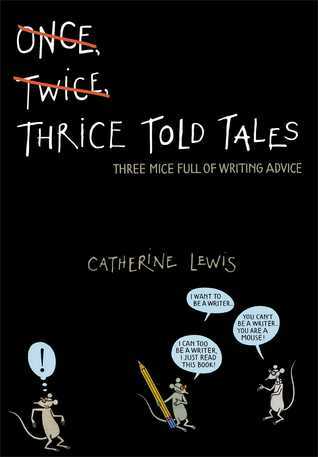 Thrice Told Tales is aimed at the young adult crowd but it’s entertaining for adults, too. If you’re interested in being a writer, or if you just enjoy reading, you’ll appreciate the way this book breaks down various literary terms in addition to offering helpful writing advice. Each description/explanation in the book uses the story of the Three Blind Mice as its basis and after reading through an example that demonstrates the highlighted term there’s a snippet at the end that gives you a very concise definition to make sure you fully grasp everything. Illustrations accompany each entry and the book’s appendix provides a little more detail about each literary term. I definitely thought this was a fun way to get people familiarized with literary terminology while also helping you appreciate the writing process and all that goes into it. It’s a small book with a ton of easily accessible information.